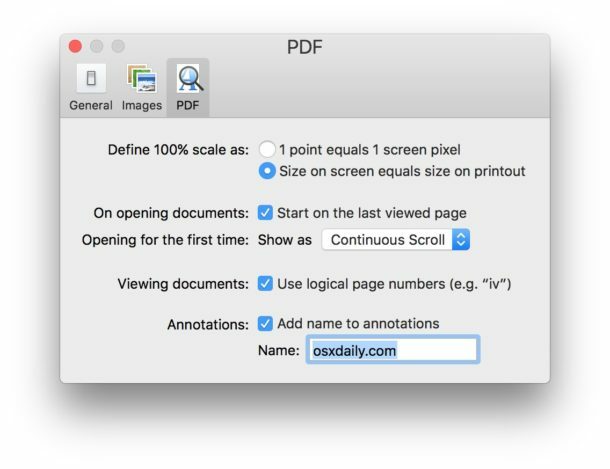 The Preview application for Mac defaults to attaching a name with any annotations made on images and PDF files within Preview, the annotation name is then embedded with the image file or PDF as metadata. This name, which is usually the currently logged in user accounts full name, is included with all annotations done within Preview, like arrows, shapes, text placed on pictures, filled out PDF forms, signed documents, and more. If you want to change the name assigned to annotations in Preview, or disable the annotation naming feature completely, you can do so. You can also remove annotation names from existing files if need be. Now going forward there will no longer be a name attached to annotations made within Preview app on the Mac. You can also change the name set by annotations by simply deleting the default name (which is usually set as the name of the currently logged in Mac user account), and replacing it with a new name. You can set any name you want in the annotations section and that name will embed as metadata with each annotation made in Preview app. And in case you were wondering, yes, the annotation setting for all images and non-PDF documents is under the PDF tab, even if you never use annotations for PDF files. How do you remove annotation names from existing images and PDF files? 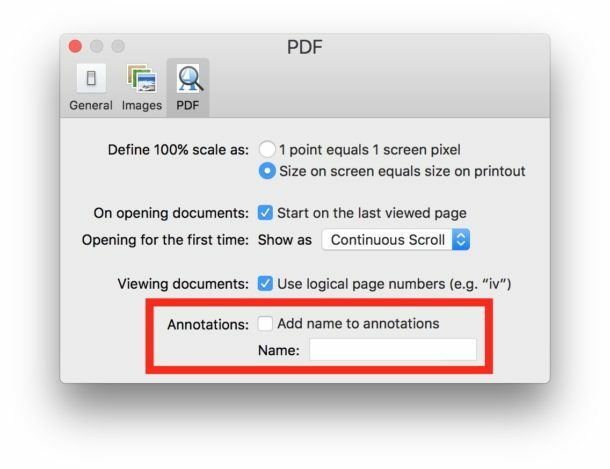 You can remove annotation names by opening an image or PDF back into Preview and then disabling the feature and re-saving the file in question. Another way to remove annotation names, which is perhaps an easier option for multiple images, is to download an app like ImageOptim that strips EXIF data from images, and then drag and drop pictures with annotations into the the ImageOptim app. Since the annotation data is EXIF metadata, the annotation names will be removed, though the annotations themselves will remain. 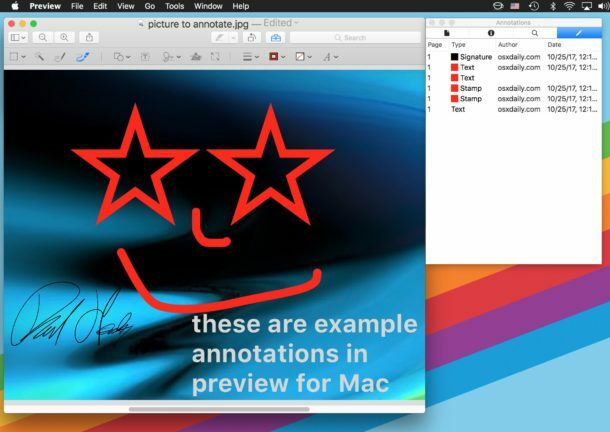 How do you view annotation names in images within Preview on Mac? Open any picture that has been annotated in Preview on the Mac, then pull down the “Tools” menu and choose “Show Inspector”, then click the tab that looks like a pencil icon to find the annotations and, if relevant, any annotation name attached to the annotations made to the image or PDF file. If you enjoyed this tip you’ll undoubtedly appreciate many other Preview tricks we have covered before too, it’s really one of the great unsung Mac apps that come bundled with Mac OS.